Hi guys, I hope you are having an eggcellent day and have been on many an Easter egg hunt to find your scrumptious treasure. I on the other hand have made this delightful Sailing bunny on his wonderful Easter Egg boat. 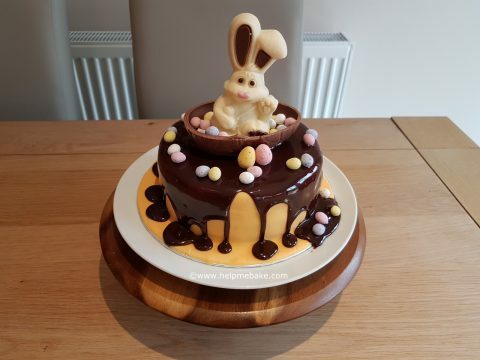 The cake is a chocolate sponge filled and covered with Chocolate Fudge Icing. 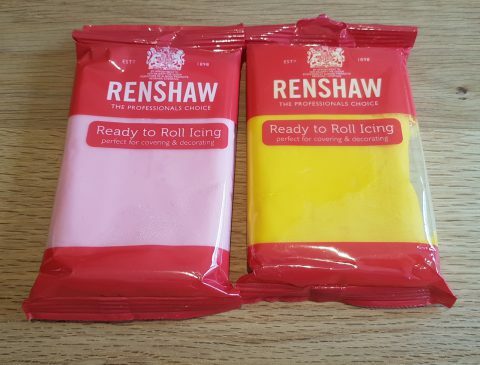 The original icing idea was to do a marble effect of both the pink and yellow icing, however when I mixed them together the yellow fully absorbed the pink and I was left with the golden colour that you can see on the cake. Once I covered the cake I then set about microwaving the mirror glaze. I have wanted to try this for a while now and thought it might look good as a dripped glaze on my cake. I followed the instructions which is to remove the plastic pot from the packaging, remove the lid and then place in an 800w microwave for 30 seconds and then a further 30 seconds. The first 30 seconds softens the glaze so I stirred it but still found big clumps in it so I put it back in again and cooked it for another 30 seconds. This time it had fully melted and was ready to pour. Because the glaze is very hot I stirred it to cool it and then poured it into a jug so I could distribute the chocolate over my cake where required. I continued to stir some more to release as much heat as I could and then began to pour over the edges of my cake. The glaze has a fabulous sheen to it and began to drip easily. My only mistake was to add more glaze to allow the glaze to run down. What I should have done was let it drip slowly so that I got better drip marks. If you let gravity take its course it will drip slowly and give you a more more desired effect. Remember less is more and go slow because the glaze continues to drip after you have stopped pouring! 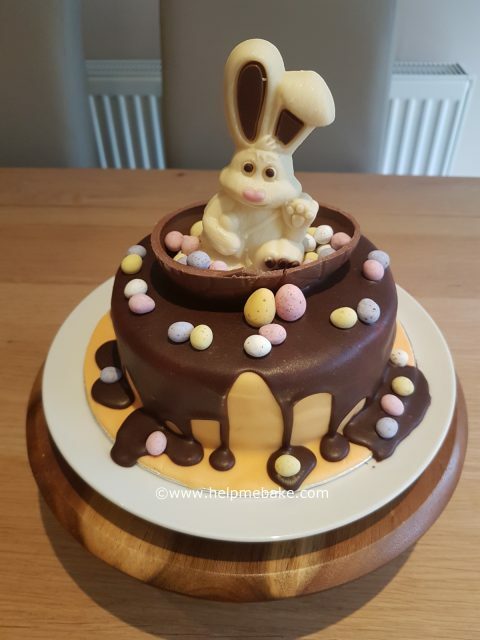 Whilst the glaze was still sticky I then stuck my hollowed out Easter Egg to the top which broke, I applied a second one and then sat the Thorntons Rabbit in the Easter Egg boat along with the Mini mini eggs. The second egg also snapped but I stuck it with the glaze and used two larger mini eggs to shield the crack. 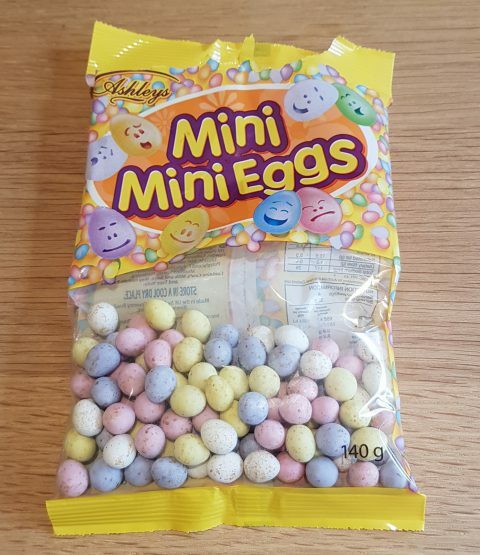 I then placed the Mini mini eggs in the chocolate river and dropped a few over the edges. After leaving the cake to fully dry, this is what it looks like today. Each time I do some form of drip cake I am learning more about the pour and drip so it’s all good practice. Next time I may look to use some candy melts for a splash of colour. It looks scrumptious Angie, and I'm sure whoever was going to eat it really enjoyed it. Just a normal Sunday here which is just the same as any other day, just the way we like now, no kids at home anymore. I made it for us! 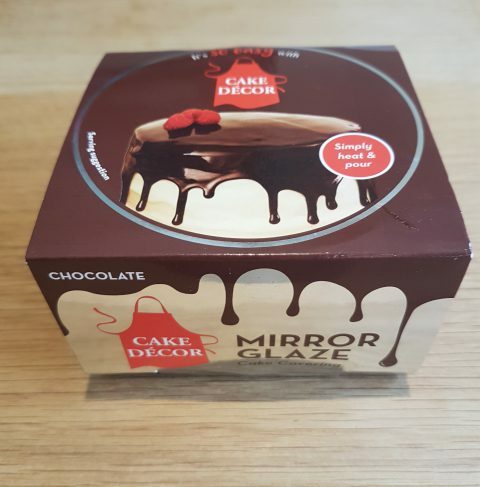 It was a bit of a throw together yesterday as I was trying out my chocolate cake on a lower temperature and I wanted to try the mirror glaze so I'll let you know what the overall taste test is like when we eventually cut it. You're right Bill, we've just tried a slice! PrevPrevMeadow cake with edible animals.